Syracuse and Tyus Battle knocked off the pound-for-pound best team in college basketball on Monday night as the Orangemen beat No. 1 Duke. 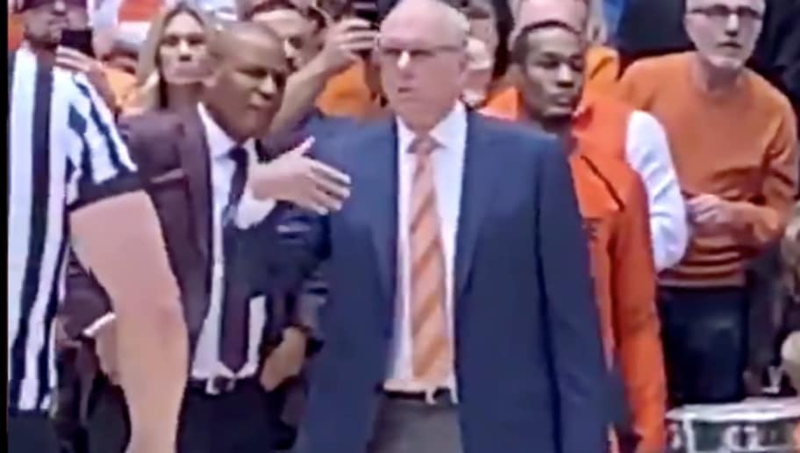 The majority of the country was rooting for 'Cuse as well, but in the waning moments, it appears Jim Boeheim had a bit of an issue. Did Jim Boeheim really pee his pants? The Hall-of-Fame coach is a prostate cancer survivor, which certainly explains the situation. This is likely just an unfortunate side-effect. Boeheim beat prostate cancer in 2001 in a well-documented battle. Boeheim is a legendary coach and this surely will pass. Or, ya know, he just spilled some water in an unfortunate spot. We've all been there--khakis don't mix well with spills. Either way, Boeheim walked off that court a winner. Considering how long Boeheim's been at Syracuse (he basically has a lifetime contract), it seems his assistants don't have the courage to tell him he ought to grab a towel of some sort. Hell, we've seen this before. Coaches often rip their $20 Kohl's khakis in the line of fire. Pants aside, this is just another incredible win on a Hall-of-Fame resume.